It's BLUE DIAMOND DELIVERY Launch Day! 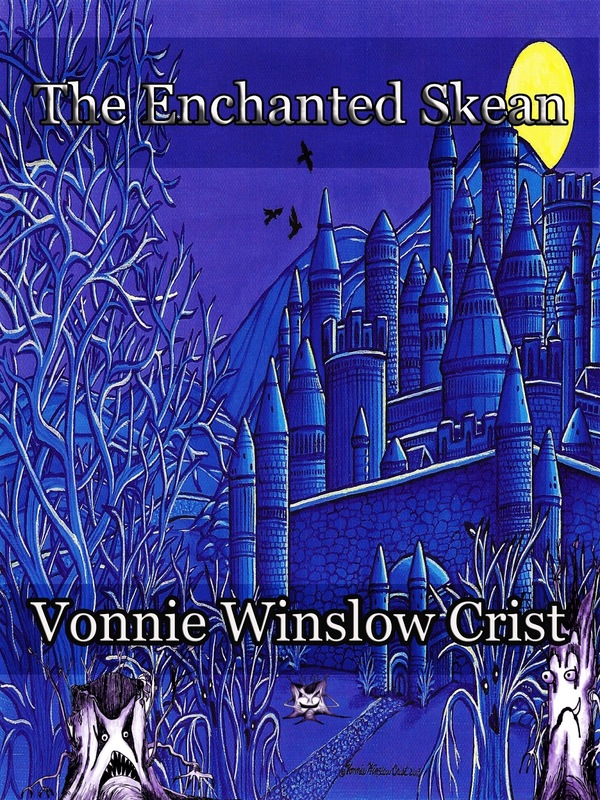 My guest today is Vonnie Winslow Crist, who explains how her fiction is constantly influenced by personal experiences, family history, and myth, not to mention feline behavior! Her new fantasy novel is The Enchanted Skean. All of my fiction begins with facts. I know that sounds counter intuitive, but it's true. The trick is to take facts and reshape them into something new. For my short stories, I begin with an unusual celebration, a scrap of mythology, a bit of quirky scientific information, or an event from my life. An example would be the Burryman's Parade. I stumbled upon the celebration in a book on British folkways and did some additional research. Then I asked (and answered in my story): What if the ocean decided to claim the boy offered to the sea to increase the fishing harvest? I used a modern day celebration in my new fantasy novel, The Enchanted Skean. The costumed dog parades sponsored by various Animal Rescue groups were the beginning place for my Clock Day Parade: “Dogs were welcome to accompany their owners to Clock Day, for it had been watch dogs that had warned the town of the approaching villains on that legendary morning when the Millak flesh-eaters attacked. The central square and nearby side streets swarmed with tail-waggers of all sorts, from the fancy lapdogs of the wealthy to the flea-bitten mongrels of street urchins...” In the novel, not only do the dogs wear costumes, they march in an honored position with the mayor's guards. 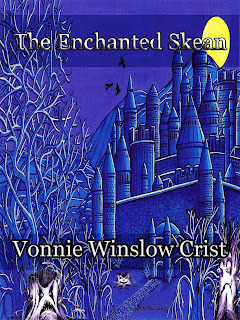 I've also reshaped lots of myths and legends in The Enchanted Skean. For example, in the Welsh stories of The Mabinogion, a woman made of flowers is turned into an owl by a magician as punishment for unfaithfulness. I asked myself: What if Blodeuwedd had daughters? Who would they be and what would they look like? My answer was an owl-sprite called a featherfay. In The Enchanted Skean, a featherfay and her sister aid the main character, Beck, after he places an owl feather in water and chants “Blood wed” three times. As for events from my life, I adopted a stray cat who terrorized any dog who wandered onto our property. Her favorite target was our next-door neighbors' golden retriever. My small orange cat would crouch under bushes and wait until the retriever got within six feet. Then, she'd run out from her hiding place hissing and yeowing. The huge dog would race home with her tail tucked between her legs. The Enchanted Skean's watch-cats who ride behind a Janepar warrior on his or her war bull and protect their partner's back during battle were inspired by my feisty cat. Plus, the folk-belief that cats have 9 lives plays a role in the book, too. Perhaps the strangest fact-based part of the narrative is Beck's attempt to bring his father's bones back from a distant town for re-burial in the family graveyard. One of my ancestors is actually buried in 2 places, because when a cousin was sent to bring his bones home he discovered the body had mummified. The only solution to the problem was the one chosen by Beck in The Enchanted Skean. Curious? Click here to read a 3-chapter excerpt that includes the Ulfwood graveyard scene. There are lots of other facts woven into The Enchanted Skean's narrative. Consciously or unconsciously, I think readers recognize strands of truth. And when those facts are twined with threads of imagined places, people and creatures, I believe it makes it easier for readers to suspend their disbelief and sink into the writer's fantasy world. You can have a look at the book trailer here. Learn more about Vonnie Winslow Crist on her website and her blog. Interesting. I want to come back and read it more fully later, when I can concentrate. Wow, I may have to use your some of your tricks. Hmmm, I think I need to dip into my geneology book and see if I can find some fun happenings to include in my stories! Thanks for the tips. What fun! I love taking fact and turning into fiction :). It's a pleasure to have you here, Vonnie! I love your essay, and completely agree that the strongest fiction has some grounding in fact. I think this is especially true with speculative fiction, lest the author's imagination take over and make the story too strange to relate to.